For use with the ecuGN. 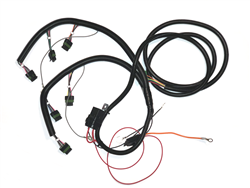 Allows the use of individual coils, and the removal of the stock ignition module. The stock module will no longer be used, as the ecuGN will control the coils directly. Includes relay and hotwire to alternator. The coils to use are LS (details coming soon). There may be adapter plates available soon for mounting.